Children and bubbles are the perfect combination for summertime fun! Every child loves playing with bubbles and so do most of the adults I know, especially moms! 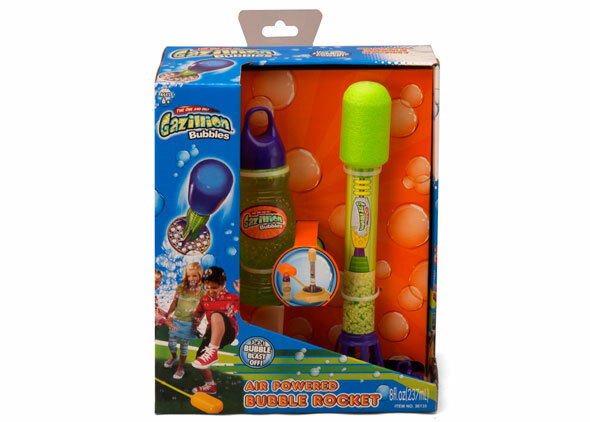 The Gazillion Bubble Rocket combines bubbles, cause and effect, science and fun all into one great summertime toy! Not to mention LOTS of laughs and hours of FUN! My kids couldn't wait to try this out! It was raining for over a week, pure torture on them waiting for their chance. They even asked if they could try it in the house! My kids are 10 and 7 years old and I'll be the first to admit that often times they are a little tough on their toys, especially when they are having loads of fun and get overly excited. As a parent, I want toys that are going to be fun, functional and durable. What good is a toy if it can't stand up to the tests that children are going to dish out? The Gazillion Bubble Rocket was not only fun but it's also built to last! Which is a good thing considering that you have to stomp on it in order to get the most AMAZING results! The more powerful your stomp the more bubbles and air you're going to see as a result! After a few practice jumps my kids quickly learned that the rocket went much higher when you jumped on it with two feet instead of one! What could be more fun than rockets, a gazillion bubbles and watching your children have a blast? 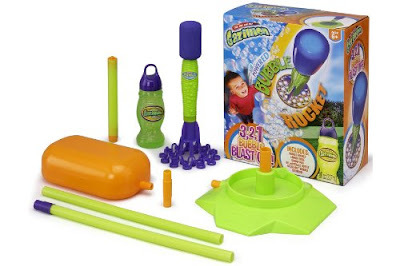 The NEWLY REDESIGNED Gazillion Bubble Rocket - 3, 2, 1 BUBBLE BLAST OFF!!! Watch a Gazillion bubbles soar into the air with this Amazing Gazillion Bubble Rocket! Simply pour Gazillion Bubble solution into the tray of the launch pad, place the rocket on the launcher, and with YOUR STOMPING power launch the bubble rocket for a bubble trail of sky high fun! Comes with a cool rocket, launcher, stomp pad and 8oz of Gazillion solution for continuous rocket fueled action! No batteries required. iParenting Media Award Winner! Visit Funrise Toys and tell me what other Gazillion Bubbles Toy you would like to have. A special thanks to Funrise Toys for this wonderful opportunity! Awww my daughter would love this...I wish it was open to Canada...Oh well maybe next time. I liked your kidorable photo contest entry! would love the bubble bug! I would like the football. My son would love the Tow Mater Gazzler Motorized Bubble Blower!! gazillion bubble typhoon looks like fun! The bubble hurricane looks great too! I am a facebook fan of Funrise (Marysa N).